Manchester United gaffer Louis van Gaal has dropped a major hint that the club could be set for a ‘surprise’ striker signing, after his team’s 1-0 win in a pre-season friendly against Club America in the International Champions Cup according to a report by Manchester Evening News. The Red Devils are rumoured to be interested in signing either PSG’s Edinson Cavani or Bayern Munich’s Robert Lewandowski after the departure of Radamel Falcao and Robin Van Persie’s transfer to Fenerbahce, and had only two recognized forwards on the pitch in the friendly – Wayne Rooney and James Wilson. New signings Memphis Depay, Matteo Darmian and Morgan Schneiderlin were given run-outs along with several first-team members in the first half, while Schweinsteiger and a handful of youngsters started the second half. The only goal of the match came in the 5th-minute courtesy Schneiderlin, who netted a looping header after receiving a cross from Mata. 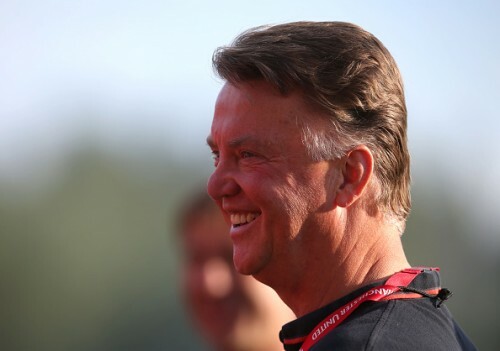 Speaking with the press after his side’s win, Van Gaal seemed calm when asked about United striker’s situation. He added that the situation didn’t concern him, and that club could purchase a forward before the transfer window shuts on September 1. "We have Rooney, he can play in striker's position, and all media had written he should play there so I listen and now you put this question so I don't know what you want. Also [Javier Hernandez] and maybe Wilson and maybe there comes a surprise. It's a process. I'm not worried about that position," he said. Mexico international Javier Hernandez is expected to return to the club after spending the previous season on loan at the Santiago Bernabeu, and Van Gaal seems ready to give the striker an opportunity to resurrect his United career. "Hernandez is coming [to the United States] on July 25. He can prove himself and now Falcao and Van Persie are gone so his chances are better now." Javier Hernandez suffered a shoulder injury while on international duty with Mexico, and is expected to report to pre-season training next week. He had a mediocre season at Real Madrid, scoring nine goals in 33 appearances, with most of them coming off the bench. The Mexican striker joined Manchester United in 2010, and has scored 37 goals in 102 league appearances.